Choosing wall colors is a matter of personal taste. However, there are a few basic principles which should govern this choice. When it comes to choosing wall colors for a home, experience has proven that it is better to use few colors in preference to many. The same is true when putting together individual room color schemes. As a matter of fact, it's possible to create a very attractive room using only one color both for painting and decorating - this is called a Monochromatic color palette. Why limit yourself to only few colors? 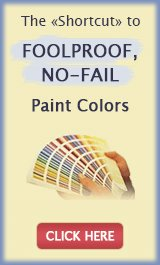 Because the success of your painting and decorating efforts is not in how many colors you pick, but in the way you use them. If you are craving variety in your home decorating color scheme, the answer is not to add more colors, but to use different shades of the existing hues. 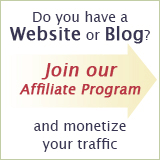 You will add interest through the use of floral, geometric and/or striped designs and different textures. Also, pay attention to how well your colors flow from room to room, and how consistent your home color scheme looks overall. The best way to create a sense of continuity is to use 2-3 colors interexchangeably throughout the house, in different intensities and proportions. If you live in an open floor concept home, refer to "Selecting Paint Colors for Open Areas" for guidelines and specific examples. 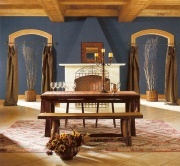 Dark, deep colors are the luxury that only the owners of large homes can afford. Large homes usually have bigger windows and more natural light that makes deep colors look dramatic and impressive. The same color in a small-sized home can look gloomy and depressing (because small homes tend to be already on the darker side). Plus, dark colors are visually advancing, which makes the room feel smaller - most likely the effect you do not want in an already small house. This enclosing effect can be desirable only in a large home. When choosing wall colors for a small home or apartment, try to stick with medium toned shades or lighter throughout the entire space. 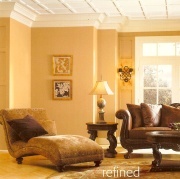 Medium toned colors can be used in both dark and light rooms, while pale colors look best in sunny rooms. Contrasts in room colors in small living quarters are not desirable, because they make the space look jumpy and uneven. Rooms painted in high contrasting colors require enough neutral transitional space (like foyer and hallways) to help reset the eye - and in a small home transitional space is too small to do this job. 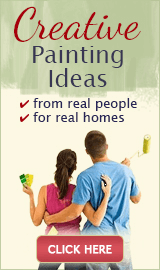 The owners of large homes have more options when it comes to creating paint color schemes. They can afford to be as dramatic as they like (really deep colors, high contrasts) - a big home can usually take it. Just keep in mind that only because you can go wild in a large home, doesn't mean you should.